Caricatures are probably one of the most subtle art forms that reflect a state of mind in a society and time. 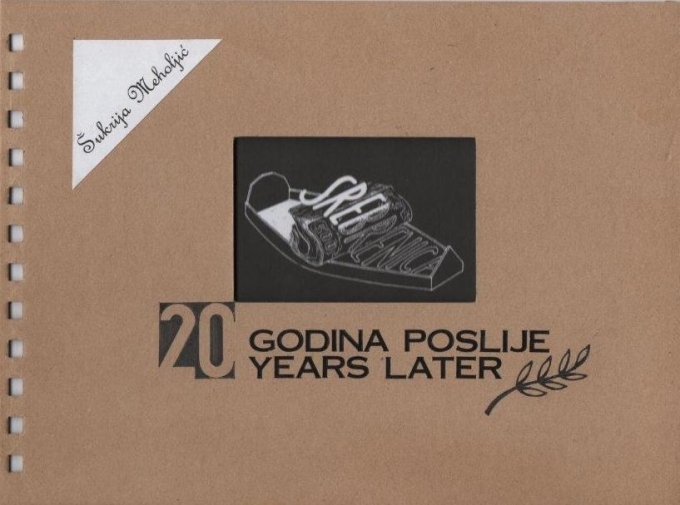 Šukrija Meholjić succeeded, with his book named “20 years later”, to express a phenomena that, after so many years, still survives – denial and insensitivity. His caricatures speak precisely not only about the aggressor (Serbian) side, but also about the indifference of the international community and the helplessness and inability of the local community to turn towards the future….. In that art, a new form of thinking about the Srebrenica genocide, in the year in which we celebrate the twentieth anniversary of the start of the biggest crimes in Europe since the Holocaust, there appears a very important work of one of the most prominent Bosniak cartoonists, Šukrija Meholjić, “20 YEARS LATER”…… I recommend printing the book “20 YEARS LATER” because it will, with its message and lessons, not only testify to the crime of genocide in Srebrenica, but also activate generations to come to use all kinds of art to raise the voice for truth about this crime and justice for its victims. His caricatures are not only first-class drawings; they have a political message as well. Through them we can follow the tragic events seen through the eyes of an intellectual who has his opinions, who wants to tell us his point of view, who has a message for the world. His caricatures are proof that the artistʼs pen can be as effective as a weapon……. Šukrija Meholjićʼs caricatures remind us of the existence of those shameful and tragic events, the cynical politicians, the incompetent diplomats. The book is dark and the content is a permanent record of the dark times. Just knowing that this book exists, however, shows there is a ray of light, a trace of hope, that it will never happen again! As it is your mother tongue. If you just keep silent. With all honors and piety towards innocent victims, with respect towards this excellent poet and his clear message, we should also say here that while I keep silent, you keep silent, he keeps silent and we keep silent, they, the potential architects of evil, in their silence, design new crimes. We were forced in time and space, and we also have done it ourselves, to keep silent and forget the previous genocide, so, the eleventh genocide happened, this eleventh one being the most unhuman of all – the genocide in Srebrenica. A seed of death was planted in Srebrenica, but also in whole Bosnia and Herzegovina which is one large Srebrenica, an open wound that bleeds. It would be tragic if oblivion would sprout from this seed. We neither have the right to forget, because of the dead, but also because of the living and of the unborn, nor do we have the right to bury the truth with silence. We have to keep slapping oblivion in the face, because oblivion is a light house for evildoers on their way to a new genocide. The one who forgets, lives through it (the forgotten) once again. It is therefore an imperative of every truth lover to cherish the culture of personal and collective memory and witness of mindless acts of violence, by various forms of art expression and thinking. Art is a living memory and greatest revenge against nonhumans for crime against the innocent ones. This is the fluid that carries through time for future generations, in the best way, the message of crime. My new book of caricatures named “20 YEARS LATER”, published on the occasion of twenty years after the Srebrenica tragedy and Dayton (no) peace, is my humble contribution to the mosaic of culture of remembering the genocidal aggression on Bosnia and Herzegovina, and focusing on the planetary crime – the Srebrenica genocide. This book represents a unique continuation of my first book “Under the UN Protection”, published in 2007, in which I continue to follow, with my drawings, the difficult reality of the post Dayton Bosnia and Herzegovina. The drawings were made as the events they refer to happened and as such follow the same order in the book. The book, conceived in such a way, has a role of testifying, reminding and warning on evil times in which our homeland was murdered in aggression and also is continuing to be murdered in so called peace. I have screamed as hard as I could, speechless – with no words, at least to wake myself up. Maybe I will, who knows, touch someone’s conscience or encourage that someone to think. Maybe. Srebrenica died several times throughout its long and turbulent history only to always rise again like a phoenix from ashes, even more beautiful, tempting and proud. But from the last deadly genocide in the summer of 1995 it somehow fails to recover. Srebrenica was alone in the world in 1995, yet the world was there in Srebrenica! Abandoned, forgotten and left alone to itself then and now, after 20 years. Why didn’t the World even try to, at least a little bit, wash off its unclean conscience by greater material aid to Srebrenica? The survivors deserve at least that. O, World, tell me why Srebrenica still is a “Charity city” and why does its greater part still lie in a tomb? And tell us once sincerely NEVER AGAIN! I wish here at the end to express publically my thanks to the responsible editors of various Bosnian newspapers, magazines, portals (Bosanska posta, Bosnjaci.net, Tacno.net, Klix, Avaz, Oslobođenje, BH magazin, Doznajemo, …) as well as the editors of the Norwegian newspapers (RHA, DT, BT, Aftenbladet, Aftenposten, VG, Klassekampen, Ny Tid, Adresseavisen, Vårt land, Nordlys) who recognized the values of my drawings’ messages and who wrote texts and published them openly. By doing this, they have, along with all the positive reactions of audiences at numerous exhibitions I held in various countries, made my will to persevere in my intention, even stronger. I convey my warmest thanks to the esteemed reviewers: Ms. Sonja Biserko, the founder and president of the Helsinki Committee for Human Rights in Serbia, professor Emir Ramić, Manager of Institute for Research of Genocide Canada and dr Svein Mønnesland, professor of Slavic languages at University of Oslo, as well as all other individuals for their assistance and help. I owe large gratitude to THE ORGANIZATIONAL BOARD FOR MARKING OF THE 20th ANNIVERSARY OF THE GENOCIDE IN “UN SAFE HAVEN” SREBRENICA, the publisher and sponsor of this book. A special appreciation goes to my wife Jasminka for 20-year long tolerance and patience.